A wise man once said that artists can put beauty into the world, but not rationality. This helps explain why Germany, birthplace of Beethoven and Strauss, could have embraced the cruel, inhuman Nazi regime. The relationship between music and irrationality lies at the heart of MY FATHER'S SON--A MEMOIR, by Dimitri Drobatschewsky. The latter, who served for 20 years as the music critic for The Arizona Republic, has endured many of the world's horrors in his lifetime. 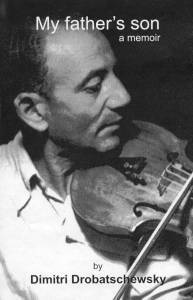 His beloved father, a first-class violinist, was murdered in Auschwitz, and Drobatschewsky himself narrowly escaped the same fate by fleeing Germany and joining the French Foreign Legion. During his five years with the Legion he fought in North Africa, France and Italy, surviving front-line battle with its inevitable horrors and atrocities. He wrote MY FATHER'S SON, he says, to show "that it was possible to live with the scars and memories of those horrible war years and still make a worthwhile life for myself. I did it by making music my religion, and by trying to concentrate on all that is good in life--and there is plenty of that--while at the same time relegating negative thoughts to a far corner near the back of my mind, a place where these things can be coped with, but where they will remain under control, forever." Drobatschewsky's relationship to his father, Henry, provides another key to the author's life. The Russian-born Henry was part of a musical family; at age 25 he joined a string quartet in which his uncle was the lead violinist. When the first world war broke out, the quartet was stranded in Berlin, where Henry quickly established himself as a musician and concertmaster. "Dad was a wonderful musician but a poor politician," Drobatschewsky admits. "He was not good at negotiating contracts. He was often left stranded instead of being rewarded with long-term engagements...My father endured many humiliations together with a number of honors bestowed on him, but he often said that all that counted for him was that he was 'making good music.'" For many years Drobatschewsky felt that he had not really fulfilled his father's expectations. His sense of guilt and failure was particularly acute in the years following the end of WW II. Realizing that he was not good enough on the viola to become a professional musician of his father's caliber, he turned to the business world for sustenance, first in Paris, then in the USA. Along the way he also married (twice) and fathered some children. Although he admits that he was no great shakes as salesman, his standard of living rose and he could superficially consider himself a success. At the same time, his love for music became more and more important, leading him to start collecting classical recordings, books about music and musicians. Deep inside, though, he felt dissatisfied and was often tormented by nightmares about his father. It was not until he made a trip, in the 60s, to Auschwitz that his torment began to subside. "My visit made a tremendous and indelible impression on me," he writes. "But the strangest of the immediate results was that all of a sudden, literally overnight, I no longer experienced these nightmares about my father." The pain he felt at having survived Hitler when his father perished at his hands, subsided. What also fortified him was the success he achieved as a music critic, a job he more or less fell into when his career as a traveling salesman came to an abrupt end. Even though he was obliged to write in English (his third language) and had never trained as a journalist, Drobatschewsky soon became one of America's distinguished music critics, covering concerts not only in Phoenix, Tucson, New York and Los Angeles, but in major European cities as well. His recollections of those events and of the musicians and conductors he has met and interviewed over the years, such as Yehudi Menuhin, Jascha Heifetz, Yo-Yo Ma, Riccardo Muti and Dietrich Fischer-Dieskau, help make MY FATHER'S SON the splendid memoir it is.